Sunday April 17th 1892 "Easter Sunday" I was busy with the work all forenoon. The folks were over from town after dinner and I talked with them. Will had gone out to Woolfs. I had a letter from Charlie and he told me about their intended move to Kirkwood, Mo. Will and I read all evening. Monday April 18th 1892 The girls who had promised to come did not appear. Mother and I worked all the forenoon with the work. Soon after dinner Will and I started out to find a girl we rode all afternoon. Leonard said in the evening he had a cousin in the county he thought would come and work. I went to bed early. Tuesday April 19th 1892 Leonard started early this morning to the county he got back by half past nine and helped me with the washing. I worked on till three oclock in the afternoon doing some cleaing up. The girls were over from town. Leonard went after his cousin and brought her before supper. I wrote to Charlie. Flora mare has a little horse colt. 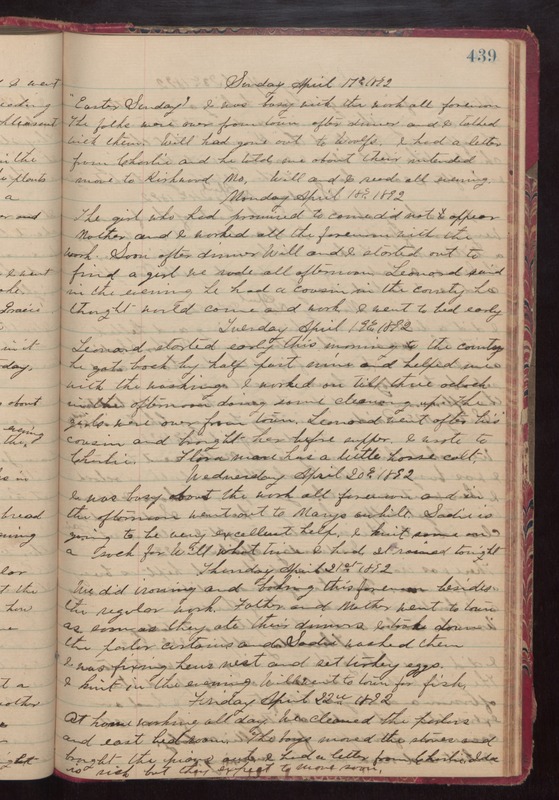 Wedneday April 20th 1892 I was busy about the work all forenoon and in the afternoon went out to Marys awhile. Sadie is going to be very excellent help. I knit some on a sock for Will what time I had. It rained tonight. Thursday April 21st 1892 We did ironing and baking this forenoon besides the regular work. Father and Mother went to town as soon as they ate their dinners. I took down the parlor curtains and Sadie washed them. I was fixing hens nest and set turkey eggs. I knit in the evening. Will went to town for fish. Friday April 22nd 1892 At home working all day. We cleaned the parlors and east bed room. The boys moved the stoves and brought the piano out. I had a letter from Charlie. Ida is sick but they expect to move soon.